Peel and stick badges (or butterfly badges as we refer to them) do not require a plastic wallet, and are therefore less hassle at the registration area. They are printed in one pass in full colour, on an A5 carrier. They are not designed to be stuck directly to clothing. When printed the badge itself peels off the carrier, folds in half and can be attached to a lanyard or clip. 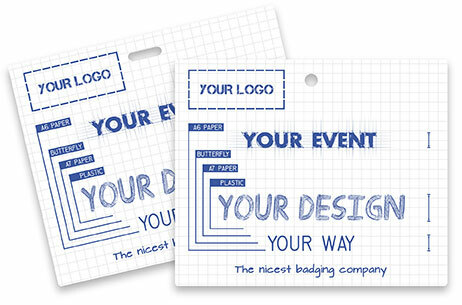 They can be supplied with a slot or hole at the top of the badge. The badges measure 96 x 80 mm.